Moticam X is a 2 megapixel microscope camera that includes its own WiFi. You can use this microscope camera without being on a network, and with no need for cables connecting your camera to your tablet, computer or cell phone. This camera is the perfect solution for classrooms or households with multiple children. Streaming images are sent to up to six devices without the need for a router or a network. 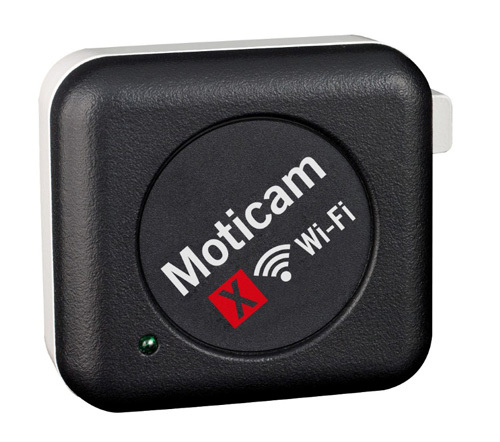 The Moticam X generates its own WiFi signal. In order to use the camera on your device, you simply need to download the Apple or Android App. The wireless Moticam X microscope camera includes software and can be used on a standard laptop computer for capturing images, making measurements and saving images. This microscope camera is perfect for teaching environments or the workplace where multiple users need to be able to view and identify specimens up close simultaneously. You can purchase the Moticam X wireless microscope camera here.